Plants and fungi form two great halves of the Earth’s lungs. The plants breathe in the carbon, turning it into more of themselves — the leaves and the wood and the roots. This feeds all the world’s animals, eventually. The fungi breathe the carbon back out into the air, so that the cycle can continue. Let’s look at this more closely: if you pull a body (say, your body) into all of its myriad pieces, down to the smallest parts of which it is made, you’ll find that it takes only a few different kinds of atoms (the basic building blocks of all matter, all stuff) to build a living creature. The beautifully tricky bit is, atoms are like legos, which can be built up in an infinite variety of ways, which is why the world, and all life, has such infinite variety. In the building of all the structures that make up a living creature, one type of atom turns out to be incredibly important: carbon! Now there’s lots of carbon in the world, but most of it is floating around as carbon dioxide in the air. We, as animals, can’t use the carbon in carbon dioxide — it’s the wrong end of the cycle for us. Plants, though, can use it. Plants breath in the carbon dioxide in the air, and use the energy of the sun to rebuild the carbon into new structures, structures that become part of the plant! Because of this, the continuous cycling of carbon (the breathing of the Earth) is intimately bound up with the flow of energy through all life. These newly created structures, these plants, contain the carbon in a way that other life, like animals, like you, can use! So, animals eat the plants, both to gain the carbon that the plants have pulled from the air so deftly, and to gain the energy that they have saved from the sun in doing so. And when you use the energy that the plant has stored up, the carbon is converted in your body back into carbon dioxide, and you breath it back out into the air. And the cycle can continue. This is the great magic of plants: they pull the carbon from the air, and in so doing they save the energy of the sun. All other life—fungi, animals, bacteria—in one way or another, depend on this reservoir of energy. Even the hawk, who eats only mice and other little animals and would never deign to eat a plant, depends on the sun’s life-giving energy trapped by the plants, for where does the mouse get it’s energy from? From grasses and seeds! It all starts with the sun. But of all the carbon pulled from the air and built into plants, animals only eat a tiny fraction. The rest stays with the plants throughout their lives, and for the cycle to continue, must return to the air after a plant’s life is done. This is the role of the fungi: they are the great recyclers of world. You see, like animals, fungi must eat to live: they cannot pull carbon from the air, or use energy from the sun. They are like us in this way, and they have a great taste for plants. Only fungi can completely eat a tree trunk: all the complicated, twisted little pieces that the tree has built out of carbon throughout it’s long, long life are much too difficult for any animal to make use of, but some fungi can! The role of the fungi in the great cycle of carbon is to pull apart the complex structures that the plants have made, and return that carbon to the air as carbon dioxide — in doing so, the fungi are fed, and the carbon returns to where it started, the beginning of the cycle. Laetiporus conifericola, the Sulfur Shelf. This fungus eats the wood of old Douglas firs, and the mushrooms are quite tasty to eat; the flavour is similar to chicken, so some people call it Chicken-of-the-Woods. When next you see a fallen log or a dead tree in the forest, look to see if you can find the mushrooms of the fungi that are eating it. Perhaps you will find a polypore like this Laetiporus (or Sulfur Shelf), which slowly and patiently eats the wood of old Douglas firs, returning the carbon that the tree pulled from the air back to the air where it can be used again. If you feel like it, pat them gently on the cap, and thank them for their role in maintaining the cycle of life. You can think of the great cycle of carbon like a waterwheel, capturing and using the energy of a flowing stream. In the waterwheel, the rush of the river pushes the wheel around, so that the turning crank can do some work, like turning a millstone to grind grain. The energy of the river is captured, used. The sun’s energy washes over the earth like a river, and flows through all the life that you can see around you. It is this constant flow of energy out from the sun and through life on Earth that turns the great wheel of the carbon cycle, and it is the carbon cycle that allows that energy to be captured and used as life. It is the sun that powers life on Earth, and it is the wheel of the carbon cycle that serves to harness that power. The turning of that wheel is the great breathing of the Earth, with all the plants of the world inhaling the carbon, and the fungi — but also, all the animals and every other living thing — exhaling it back out again, so that the wheel can keep on turning. I’d like to produce a cute carbon cycle illustration to go with this section, showing the major pools of carbon and the transitions between those pools (plants fixing carbon, animals eating the plants, and fungi decay the dead plants and returning the carbon to the atmosphere) as well as the flow of energy through the system; I haven’t found a good diagram out in the world that illustrates the water-wheel metaphor, so I think I’ll just have to make one. I think this would be a really lovely lead into another section on the Carboniferous period (to be illustrated with lush watercolours of fern forests and dinosaurs!) and the evolution of lignin and lignicolous fungi. 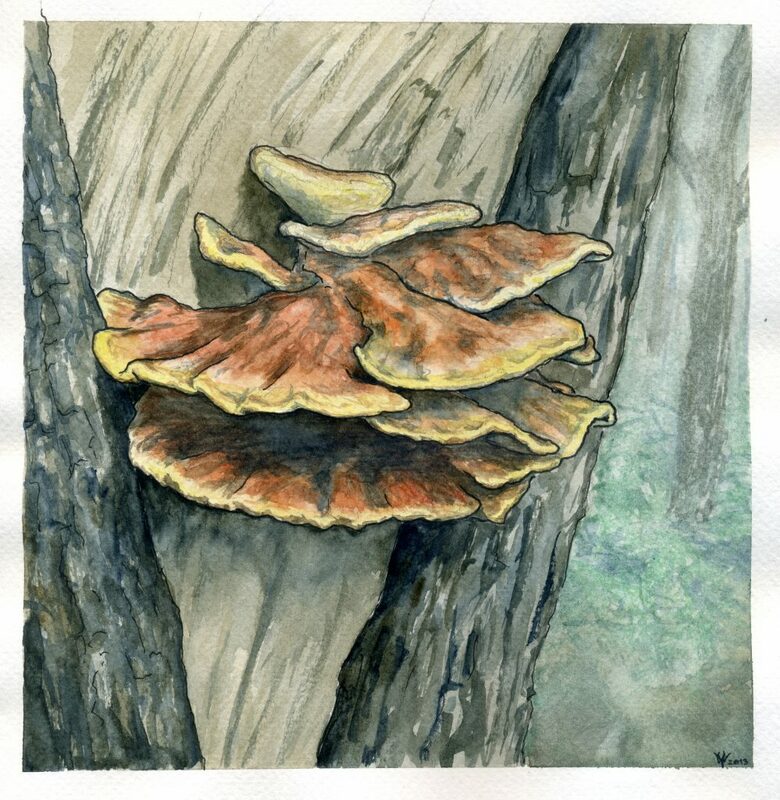 If you like the idea of a 5th-grade(-ish) educational book about fungi—intended for use in schools, for homeschooling, or for kids that love science—let me know what you’d like to see in such a book in the comments section. If you have kids and are willing to give feedback on word choice and sentence structure, let me know: I’m mostly an academic writer, and this will be the first time I’ve attempted to write for younger audiences: I could use all the help I can get! I’m also in the early stages of shopping for publishers, so if you have any contacts in that industry, I’d be interested in an introduction. This is a great idea and a thoughful presentation. Lovely, and chanting and real life! Awww, glad you liked it! I speak as a one-time reading teacher, (retired now) an sf writer still trying to get published in the main stream and also a fungi obsessive. The overarching idea, a middle school level educational book about fungi, is fantastic. I have a bit of a library, as we all have, with maybe two items specifically aimed at kids …. Before I go into any more detail I’m going to test whether my comment will ‘take’, WordPress has had an issue with me for a good few years. Hey Rita! I’d love to hear what you have to say — all the comments come through me for moderation before they show up on the blog; it keeps the spam out, as well as inappropriate content. I’d love to know what the kids book in your collection are; I’ve got Katya’s Book of Mushrooms and Plants That Never Bloom in mine. Well, what do you know … apparently I made it into the system. Taking up where I left off. Fungi texts for kids. It would be good if you could have a look at anything already out there and maybe get in contact with a teacher librarian at a grade school as to what sort of educational texts kids now go for. A lot of material will be in ebook format. Writing an an educational ebook is different from writing an educational paper book, no matter what people will tell you. For example, print-based text books tend to be linear, ebooks may be hypertexted and that is only the easiest to talk about. There is a great deal more to talk about in this direction. Maybe in a different format. eg email. I’m game if you are. The print samples I have are a British comic-style magazine aimed possibly at early teens. I could scan you a couple of pages. The other is a 16 page booklet Investigating Fungi by Gwen Pascoe, published by era-publications.com.au, 1994. It has a few problems in my opinion that would make it difficult for new readers to access. However, the text is supported by lots of quite good instructive photos and illustrations. Again scanning is a possibility. I’m going to stop right there to prevent being timed out, though I would like to rave on about content, the fantastic metaphor and the way to communicate that. Looking forward to talking more … I’m on Facebook. I can message you my email address. I’m going to message you on FB for more chatting about this! Probably tomorrow though, because it’s late here. Ah, yeah, that was a painting I already had — I like the idea of a white-rotter, because I want to tell the white-rot/Carboniferous Era story next! That’d be a great bridge. I also really love the idea of including coprophilous fungi in the carbon cycle illustration, because I’m going to have a WHOLE CHAPTER on poop! Kid’s love poop, right?